When looking at a signal affected by low level noise or spurious modulation with a spectrum analyzer, it is difficult and sometimes impossible to determine unequivocally if the observed sidebands are caused by amplitude modulation (AM) or phase (or frequency) modulation (PM or FM). One of the two pictures below show a 791.4 MHz signal FM modulated and the other picture shows the same carrier AM modulated. Can you tell which is which? Answer: The first picture is FM modulated at 400 Hz with 100Hz deviation, and the second picture is AM modulated at 400 Hz with 20% modulation. If the 400Hz modulation signal used in the second picture had some 2nd harmonic distortion, the two pictures would be identical. The techniques shown on this page use a mixer to independently measure phase and amplitude noise (or signal) sidebands. Thanks to Bruce Griffiths for the suggestions resulting in this page. All spectrum analyzer pictures in this page obtained with John Mile's excellent 7470.exe Plotter Emulator software (Note 1). 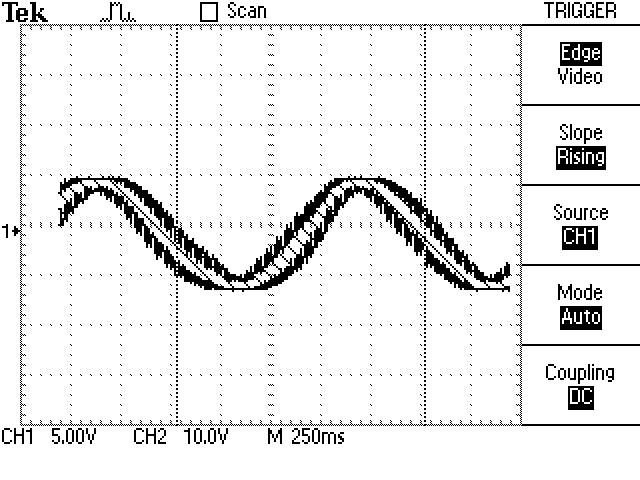 This method uses a reference oscillator which we compare against the device under test. The reference oscillator should be significantly better (usually by a factor of 10 or more) than the device under test with regard to the parameters to be tested. For this test, I used two synthesized signal generators locked to the same 10MHz reference, driving a double balanced mixer. Both generators operate at or close to 2 GHz. The IF port of the mixer is fed to an oscilloscope but could also be sent to an audio spectrum analyzer. 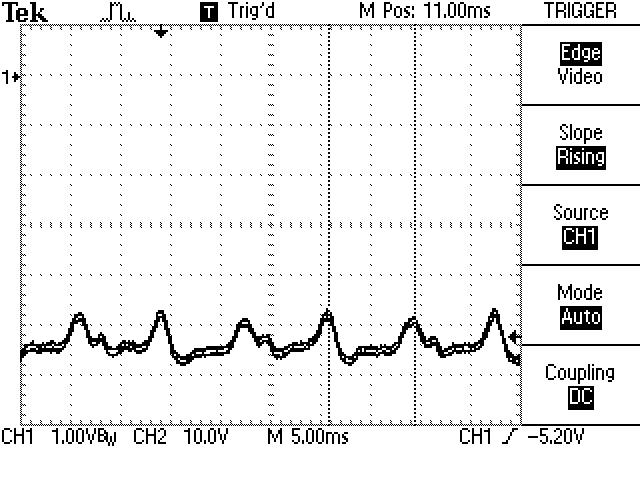 First of all, here are the phase noise plots of the generators measured directly on the spectrum analyzer. Above is the phase detector output when both generators are set to the same frequency. There is a DC offset at the mixer output which depends on the phase difference between the two signals. At the time I took the picture, the phase was not adjusted to any particular value, so we don't really know how far apart (phase-wise) the two signals are. You can clearly see the 120 Hz spurious phase modulation of the HP 8673M. Here the two generators are 20 Hz apart. The large sinewave is the 20Hz beat frequency between the two generators. 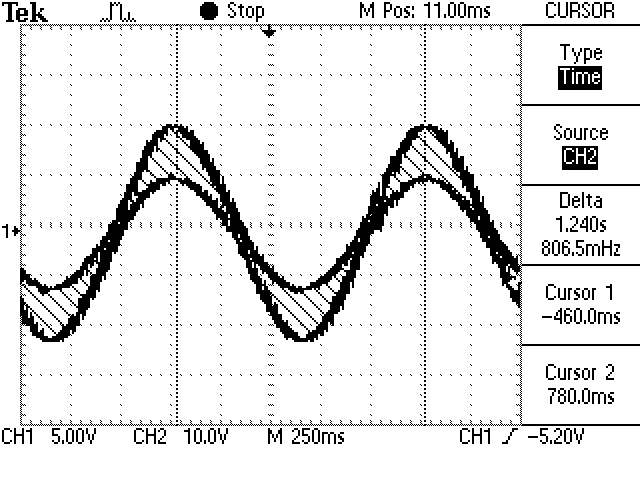 The HP 8673M spurious modulation is clearly visible, looking like noisy ripple superposed to the large 20Hz sinewave. Here the two generators are about 1 Hz apart. The generator has a 400Hz signal providing FM modulation with 100 Hz deviation. You can still see the 400 Hz modulation which appears as a thicker trace. The interesting part is that the trace appears thinner near the peaks of the sinewave. This is due to the mixer operating as an AM detector (when LO and RF signals going to the mixer are in phase or out of phase by 180 degrees) near the peak of the signal, which corresponds to a minimum in the phase (PM) response. Near the center of the screen (vertically), the LO and RF signals are in quadrature (90 degrees out of phase), which maximizes the phase (PM) response and minimizes the amplitude (AM) response. This is the same picture as the previous, but now one generator has 30% 1kHz AM modulation applied to it. The modulation appears as the width of the trace, which is now maximum near the peaks of the sinewave. These plots demonstrate how a mixer and a delay line can be used to demodulate separately the AM and PM modulation on a signal. This principle is used in most if not all the modern wireless devices such as cell phones and other wireless modems in which the LO signal is divided and one part is phase shifted with respect to the other, the incoming RF signal is also split and shifted, the two sets of signals are then fed to two mixers, the outputs of which are called the I and Q signals. Most often, the I and Q signals are independently digitized and processed by DSP, which allows all the fancy features and capabilities of these modern receivers, such as zero IF single sideband operation with software filtering. Because the Phase control of the HP 8657B is not very convenient (and it resets to zero each time FM is selected), I tried a Delay Line Phase Discriminator, also known as a Quadrature Phase Discriminator. It uses the additional delay in the longer line to create a frequency dependent phase shift (Note 3). As we have seen before, for AM detection the RF and LO signals must be in phase, or 180 degree out of phase, and for PM detection, the RF and LO signals must be 90 degree out of phase. Normally, a phase shifter would be inserted in series with one of the two delay lines in order to adjust the phase shift to exactly 0 (for AM detection) or 90 degree (for PM detection) at the desired frequency of operation. Since I do not have a phase shifter, and I did not have a particular frequency I wanted to operate at for this test, I simply selected two frequencies on the signal generator so that one frequency operates the mixer in AM mode and the other in PM mode. Changing the frequency changes the wavelength, therefore by selecting the right two frequencies, the phase shift will change by exactly 90 degrees when switching from one frequency to the other. This is easy to adjust: for AM mode, adjust the frequency so that the output from the mixer is minimum when FM is used, and for PM mode, adjust it so that the output from the mixer is minimum when AM is used. Here are the plots. In all plots, the bottom trace is the modulation frequency output of the signal generator, used to synchronize the oscilloscope. It is displayed for reference only. This is the mixer output in AM mode with AM modulation. For this test, the frequency was adjusted for minimum output with PM modulation. For this test, the frequency was adjusted for minimum AM. It is interesting to observe that there is a DC offset at the output of the mixer. 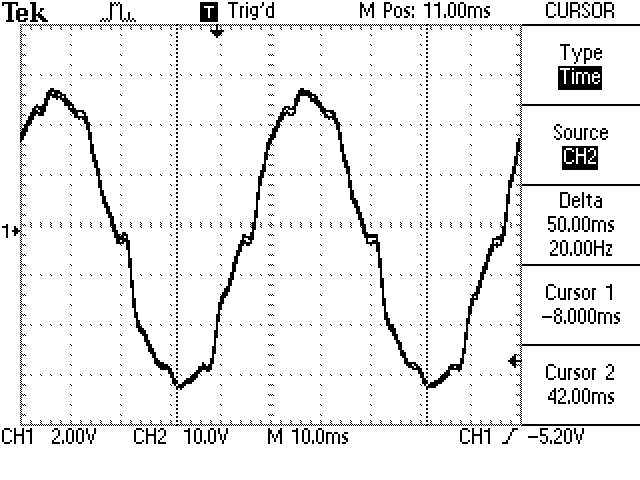 When the frequency was adjusted for minimum DC offset, the AM rejection was not as good. This is the mixer output in PM mode with PM modulation. For this test, the frequency was the same as that used for the previous picture. It's easy to see that each setup highly rejects the wrong modulation. The Delay Line Phase Discriminator is used to measure the phase noise of oscillators. The advantage of that method is that it does not require a reference oscillator or a phase lock loop. The disadvantage is that sensitivity is limited, and very low frequency response is affected by temperature changes in the delay line. However, other than the low sensitivity, it has low internal noise, the main contributor being flicker noise in the mixer. For very low phase noise, sensitivity can be improved by increasing the difference in line length. For the curious, the frequency difference of 3.69 MHz corresponds to a wavelength of 81.2 m or 266.4 feet (www.1728.com/freqwave.htm.) Therefore a quarter wavelength is about 66.6 feet. Since the actual difference in length of the two coax cables is more like 46 feet, we can calculate the velocity factor of the cable to be about 0.69.